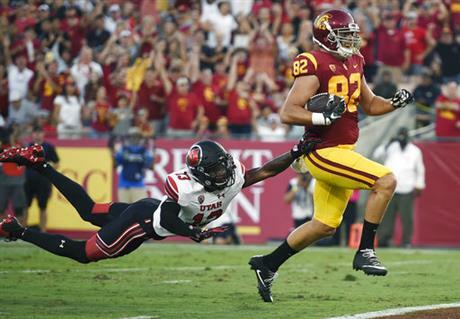 LOS ANGELES – It was a wild tale of two halves for the 23rd-ranked Utah football team against the 13th-ranked USC Trojans, as a two-point conversion attempt for the win fell short and the Utes lost to the Trojans, 28-27. Utah took a 21-7 lead in the first half, taking advantage of three USC turnovers, before Sam Darnold and the Trojans scored 21-straight points in the second half to take a 28-21 lead. Utah got the ball back with 4:54 remaining and steadily moved down the field over the next several minutes. A 37-yard reception from Troy Williams to Siale Fakailoatongaon fourth-and-1 put Utah at the 2-yard line and Williams rushed in for the score on the next play to bring Utah within a point with 42 seconds remaining. The Utes went for the two-point conversion and the win, and Williams’ scramble on the right side was a yard short. Utah was led offensively by Zack Moss, who had a career-high 141 yards rushing on 20 carries. It was his second career 100-yard rushing game. His 167 all-purpose yards includes 26 receiving yards. Nine different receivers caught passes with three going over 50 yards – Demari Simpkins (58 yards, 4 catches), Raelon Singleton (55 yards, 2 catches) and Siaosi Wilson (51 yards, 2 catches). It was a career-high for Simpkins, who also threw for a 5-yard touchdown. Williams threw for 262 yards (16-of-27, 1 TD, 1 INT), rushed for a touchdown and also caught a touchdown pass. On defense, Marquise Blair led Utah with eight tackles. Blair scored his first career touchdown on an 18-yard fumble recovery. Nick Heninger and Bradlee Anae also recovered fumbles for the Utes while Kavika Luafatasaga had six tackles and forced a fumble. Sunia Tauteoli had six tackles and two pass breakups. Mitch Wishnowsky dropped three of his six punts inside the 20-yard line, including punts at the 2 and 7-yard lines. Utah was unable to take advantage of a USC turnover on the first drive of the game, but still struck first in the first half. On Utah’s second drive of the game, an interception deep in USC territory handed the ball back to the Trojans, but the Utes got the ball right back as Luafatasaga forced a fumble on the Trojan possession, which was recovered by Blair and returned 18 yards for his first career touchdown. The Trojans came back to tie the game at 7-7 on their next drive with a four-play, 75-yard march that culminated in a 52-yard touchdown pass to Tyler Petite. Matt Gay missed a field goal on the Utes next drive to end the first quarter, but Utah would score on its next two possessions to take a 14-point lead, 21-7. 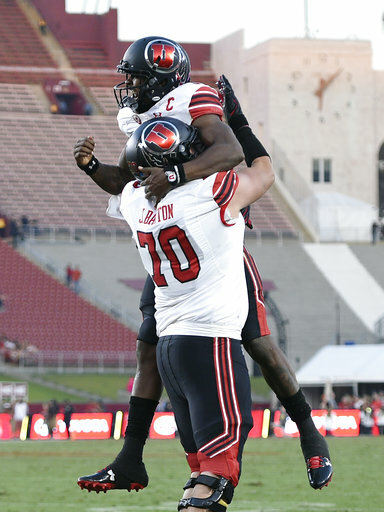 Following a short USC punt that put Utah at the Utes 45-yard line, Moss put the team on his back and ran for 50 of the 55 yards of the scoring drive that culminated in a 5-yard pass from Demari Simpkins to Williams for a score. USC again fumbled on its next drive to give the ball back to the Utes. Although Utah was helped by 25 yards in penalties by the Trojans, Carrington had 9 yards receiving and Moss 9 rushing during the drive, while Williams threw to Simpkins, this time for the 33-yard touchdown. The nine-play, 79-yard drive lasted 4:52 to complete the first-half scoring, as each team punted the remainder of the half. Although Utah got the ball to start the second half, the Utes were forced to punt after six plays and 40 yards and Wishnowsky pinned the Trojans at the 2-yard line. USC began its comeback on the subsequent drive with a 16-play, 98-yard scoring drive that took 5:33 and ended in another Darnold pass to Petite to cut Utah’s lead to 21-14. After three-straight punts, USC had the ball again as the fourth quarter began, and Darnold would lead the Trojans to scores on their next two drives to tie the game and take the lead, 28-21. An 11-play, 88-yard drive (3:03) saw a touchdown pass to Josh Falo for the tie and the Trojans took the lead on an 11-play, 93-yard drive that took 3:37 with a Ronald Jones 11-yard touchdown run. USC completed six third-down conversions in the second half, as well as a fourth-down conversion, during its scoring drives. The Utes return to the field on Saturday, Oct. 21, hosting Arizona State at Rice-Eccles Stadium. Time and network will be determined on Sunday morning. It will be at 1:30 p.m. MT on FS1 or 2 p.m. MT on Fox.